HUD New Jersey Field Office Director Maria-Maio-Messano, and THEO Enforcement Branch Chief Sharon Field attended the launch of PHASINC, a business incubator created by the Paterson Housing Authority to assist residents that participate in the HUD Section 3 Program. Every year, HUD funds create thousands of jobs across the country that range from construction to professional services like accounting or engineering. Section 3 of the Housing and Urban Development Act of 1968 ensures that HUD-funded jobs, training and contracts are provided to local low-income residents, particularly those who reside in public housing and businesses that employ them. Section 3 helps foster local economic development, neighborhood improvement, and individual self-sufficiency. The PHASINC business incubator was designed to propel and encourage the formation of Section 3 businesses. The incubator provides residents with an 11-week certification program to direct individuals through the early and advanced stages of the entrepreneurial process, as well as the tools they need so they can turn their business idea into a success. 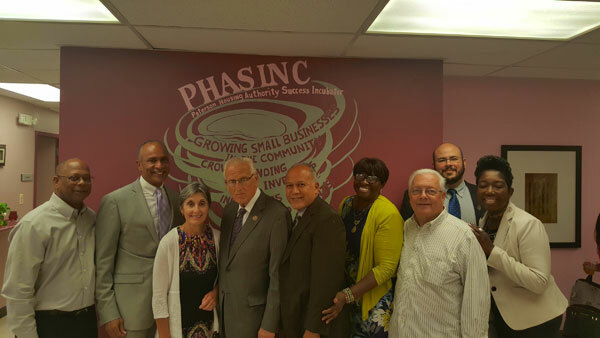 New Jersey Congressman William Bill Pascrell Jr.; City of Paterson Mayor Jose “Joey” Torres; Paterson Housing Authority Executive Director Irma Gorham; and Paterson Housing Authority Section 3 Coordinator J. Smith Bryant also participated in the PHASINC launch.